Clinic begins at 9:30 and finishes up around 3:30 and location will be determined based on current river flows and fishing conditions. We encourage you to stay after the clinic and fish what you have just learned as this is the best way to gain experience. Learn to fish the European methods like a pro! Czech Nymphing, Polish Nymphing, French and Spanish nymphing – also referred to as European Nymphing – is a style of nymph fishing that is readily catching on here in the United States, especially in Colorado. It is a very effective technique that is perfectly suited for the many faster waters of our state. This style of short line nymph fishing often uses longer rods, no yarn or foam strike indicators and a level leader construction designed to get your heavily weighted flies, often three, down to the bottom quickly. All of the weight used in a European Nymphing rig is added to the flies themselves not the leader. The flies are color coded in order to provide the angler a method in deciphering the proper weight for any given circumstance on the water. What to expect on my Euro Nymphing Class? 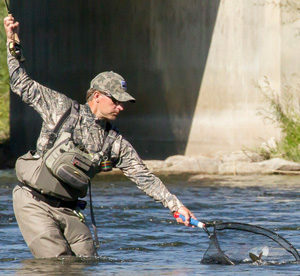 The course is taught by either Brian Kelso, an accomplished competitive angler, or Steve Parrott, a former Fly Fishing Team USA member who has studied and practiced these techniques for over 12 years or Mike Williams, who had refined his Euro Nymphing expertise over the past five years with the Blue Quill. Steve has also developed a series of Czech Leaders and Indicators that are becoming very popular within the Czech Nymphing community, as well as produced an outstanding DVD titled Czech Nymphing 101 and Related European Methods that introduces the viewer to the Czech, Polish, French and Spanish Nymphing Methods with amazing detail. Steve’s second DVD, Czech Nymphing Master Class – On Stream Tactics for Success takes the viewer to the stream to decipher the intricacies of each method and how to proficiently fish all water types and the third installment – “Tying European Nymphs – Patterns for Success” takes you into the realm of tying Euro fly patterns. Steve also has several Euro style patterns as well as a series of leaders being produced by Umpqua Feather Merchants that you will use on the river. This is a one day on-river clinic for 1 or 2 anglers wanting to take their nymphing game to the next level. We will begin with a leader rigging lesson followed by fly types used in these methods. We will then demonstrate the different methods (Short Line – Up and Across | Long Line – Up and Across | Long Line – Directly Upstream) to varying water types and how to manipulate the flies to achieve the best sink rates. We will then turn you loose on the river and fine tune your cast and drift to effectively get the flies where they need to be as well as help you best determine which method to use given the water type. This is not a beginner fly fishing class nor is it a guided trip. It is a clinic to improve your knowledge and skill level fishing the European Nymphing Methods. We expect you to have your own gear as well as some experience on the river. Great for anglers wanting to learn to fish the Euro Methods or interested in competing in the future.